The ASLA recently linked to the Synthetic Turf Council's new free guide, Synthetic Turf 360°, which promises "to showcase the numerous uses and benefits of synthetic turf [as] the first comprehensive, annotated tool of its kind". As skeptical as I am of marketing blather, especially from corporate consortia in almost any industry, I've got to say that description is just about spot-on. The guide covers applications from residential to commercial campuses and recreation facilities; water conservation; safety; accessibility; and more. Unfortunately, the piece falls short on one of its promises: it does not provide a comprehensive perspective on the environmental impact of synthetic turf. So when my clients ask me about synthetic turf, I've been reduced to telling them the pros and cons and shrugging my shoulders. It's great for some applications: dog runs, small patches of front yard where no child will ever play anyhow, shady backyards where children will play, under native oak trees, and so on. Beyond that, it's a matter of personal budget and taste. What would really tip the scales one way or the other for me? One simple, hard fact that I have yet to find: a direct comparison between the comprehensive, cradle-to-grave carbon footprints of synthetic turf and natural grass. Because for all the water and fertilizer it saves, artifical turf is still plastic, and the crumbs that prop up its blades are largely still rubber. Recycled or not, these materials originate from petroleum and require a nasty manufacturing process. 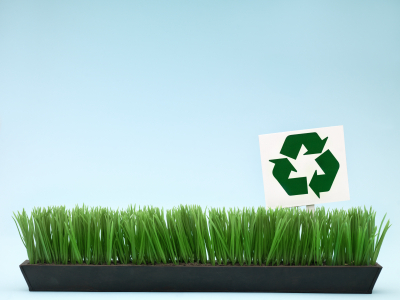 And while natural grass simply biodegrades, artificial turf never does. It eventually will be thrown away, taking up the very landfill space those tires and bottles would have anyhow. Synthetic turf may be more convenient and require less irrigation than lawn. It may be more predictable, safer, prettier and more versatile and have all the other benefits the STC claims. But every piece of artifical turf also has an ugly past that the STC conveniently doesn't discuss. And until I know more about that, I simply can't take their greenwash propaganda at face value or wholeheartedly recommend their constituencies' products to my clientele. What about you? Do you know more about turf — artificial or natural — than I do? Please chime in and help educate us all.